I’m cleaning out my pantry. First thing first the sauce section. I don’t tend to keep much now in terms of dry or can food as we are only 5 minutes drive to the shops . 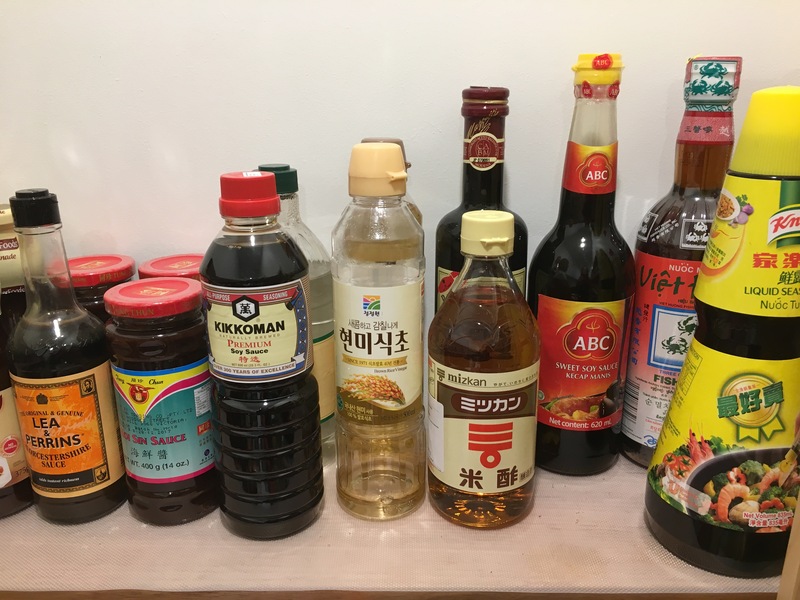 My essentials, fish sauce, soy sauce , cooking wine, hoi sin sauce, rice vinegar. The stuff I’m missing, XO sauce, oyster sauce, oils. I usually buy Bertolli olive oil. This is an Australian brand that I’ve recently swapped over for a try. 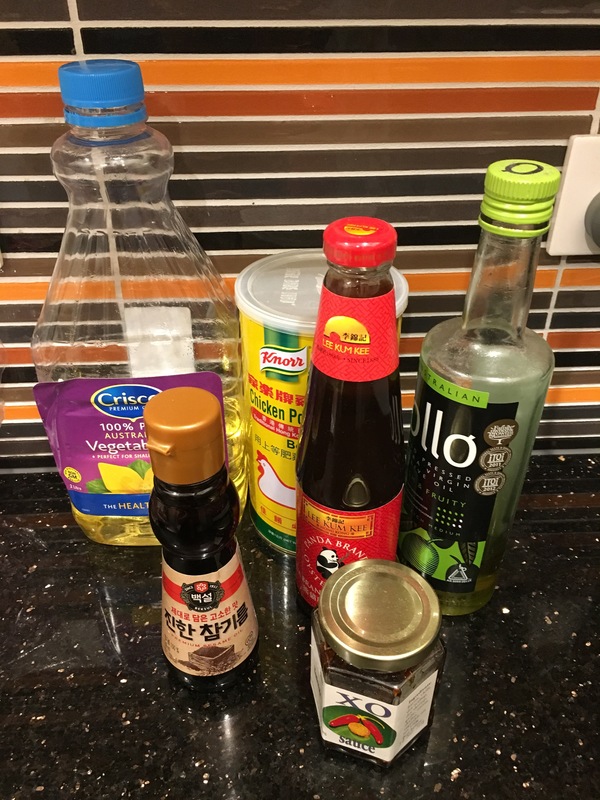 I find Korean sesame oil much nicer than the Chinese one. More flavoursome. Chicken powder for soups. I tend to just add 1 teaspoon in, habit. I use Vegetable oil or Canola etc depends on what’s available. Then comes the next bit. Black bean sauce, shrimp paste , Korean chilli paste, tofu cheese. I love the small jar eventhough hubby’s sisters say the bigger jar (to the left) is not bad. We love our fried tofu with Japanese mayo and sauce. I used to buy mắm tép (shrimp sauce ) for our steam boats. The thing is if you’re not careful the bottle explodes when you open them. The end result is fermented shrimps all over your clothes and body. Now I just buy Pantai sukiyaki sauce. It’s very spicy though. We tend to balance the taste with sugar etc and add garlic and pineapple if want to be fancy. The chicken marinade is there for a reason . The kids love it and me being lazy I have it there for a quick marinade . Still haven’t found one that I can make from scratch that tastes nice enough to go through the trouble. Then comes the apple sauce and mustard and what not. The oldest buy Japanese curry sachets to make sometimes . 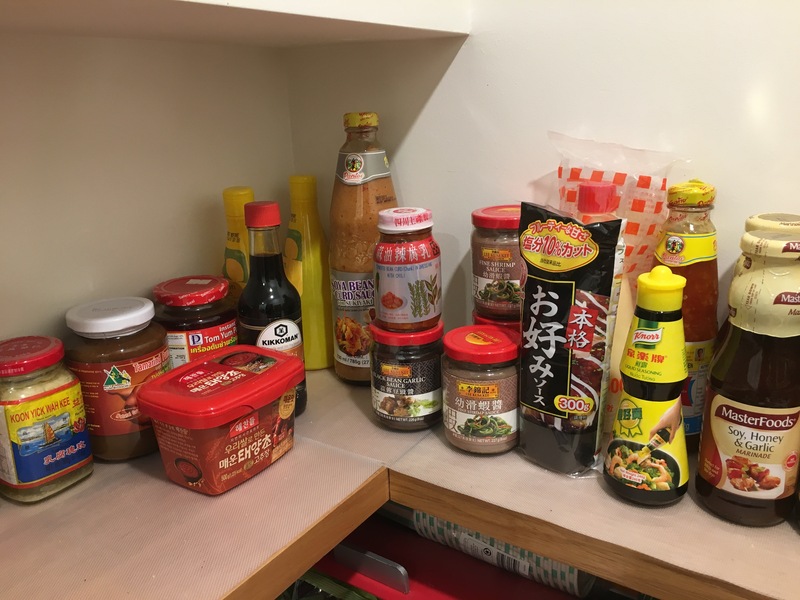 Looks like I’m not missing much from my sauce section. 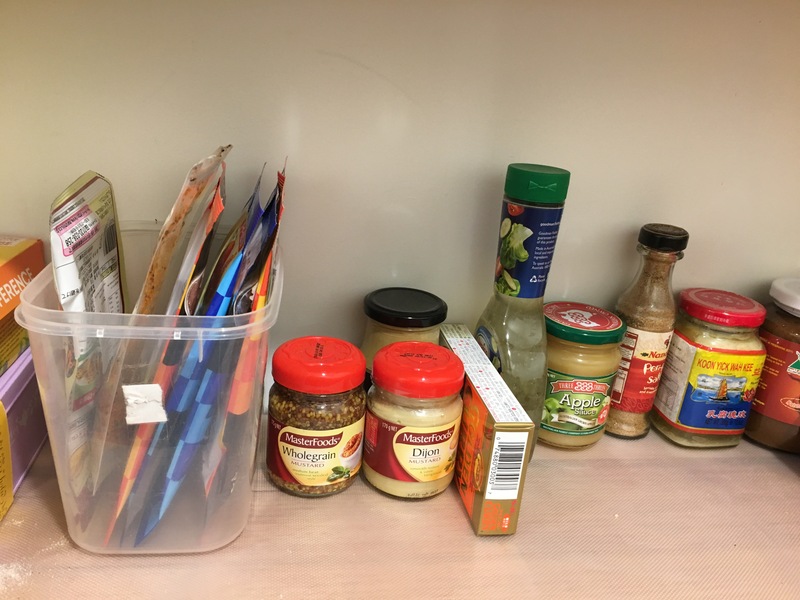 Now for the rest of the pantry.